The full lips, prominent noses, and smooth volumes of these figures characterize the art of the Chola dynasty, whose Shivaite rulers controlled South India from the tenth to the twelfth century- a period when bronze casting flourished. Somaskandamurti is a manifestation of Shiva, the greatest god of the Hindu trinity, seated on Mount Kailasa, the mountain throne of the gods. The multiple aspects of Shiva are combined in three personages: the god himself, his consort Parvati, and his son Skanda. This type of representation is peculiar to South India, where it originated during the Pallava period (about fifth to ninth century). 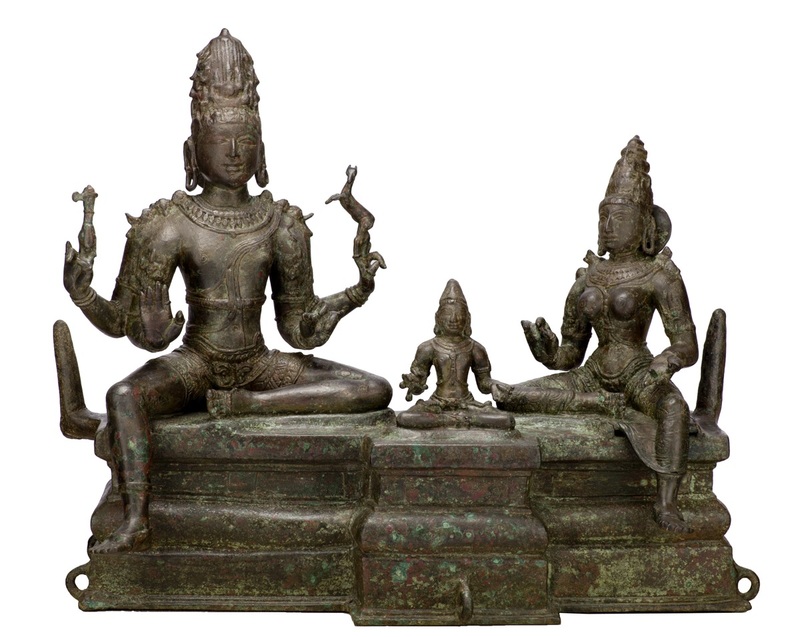 Depicted sitting with one leg bent in the position of royal ease, Shiva holds an ax (symbol of his power) and an antelope (symbol of his rule over the beasts of the wilderness). His lower hands make the gestures of holding a flower and assurance. Parvati sits in a mirror image of her consort's pose, wearing a cord with a marriage symbol around her neck. Her gestures symbolize granting a gift and holding a flower. An atypical feature is the projecting section of the base on which their son Skanda, the demon slayer, is placed. Usually he appears standing or sitting alongside his parents on a rectangular block.